Dining is available at one of the hotel's 2 restaurants, and guests can grab a coffee at the coffee shop/café. A bar/lounge is on site where guests can unwind with a drink. This 3-star property offers access to a 24-hour business centre and a limo/town car service. Public areas are equipped with complimentary wireless Internet access. This family-friendly hotel also offers tour or ticket assistance, coffee/tea in common area and concierge services. For a surcharge, a round-trip airport shuttle (available 24 hours) is offered to guests. Limited complimentary on-site parking is available on a first-come, first-served basis. 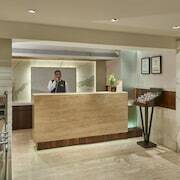 This family-friendly Mumbai hotel is located near the airport, within 1 mi (2 km) of ISKCON Temple and Juhu Beach. Kokilaben Dhirubhai Ambani Hospital & Medical Research Institute is 2.4 mi (3.9 km) away. Along with 2 restaurants, this hotel has a bar/lounge and a coffee shop/café. Free WiFi in public areas and free valet parking are also provided. Other amenities include a 24-hour business centre, coffee/tea in a common area and 24-hour room service. All 32 rooms feature thoughtful touches such as pillow menus and slippers, plus complimentary wireless Internet access and LCD TVs with satellite channels. Guests will also find 24-hour room service, premium bedding and coffee/tea makers. Hotel Bawa Continental offers 32 forms of air-conditioned accommodation with a safe and free newspapers. Beds feature premium bedding. A pillow menu is available. 32-inch LCD televisions come with satellite channels. Bathrooms include a bath and shower, complimentary slippers, complimentary toiletries and a hairdryer. This Mumbai hotel provides complimentary wireless Internet access. Business-friendly amenities include desks and telephones. Additionally, rooms include complimentary bottles of water and coffee/tea makers. In-room massages and an iron/ironing board can be requested. Housekeeping is provided on a daily basis. Bombay Brew - This restau – This restaurant serves breakfast, lunch and dinner. Guests can enjoy drinks at the bar. Starbucks – This café serves breakfast, lunch and dinner. Open 24 hours. Rollaway/extra beds are available for INR 1000.00 per night.